ANN ARBOR, Mich. (AP) — Hundreds of University of Michigan students filled out toe tags this week with information on each of the roughly 3,000 migrants who have died trying to sneak into the U.S. through the Sonoran Desert over the past 25 years and whose remains were found. The tags then went up on a giant map of Arizona: tan for those who could be identified and orange for those who could not. The installation is a test run for anthropology professor Jason De León’s “Hostile Terrain ’94” project. De León is hoping to have 94 such installations go up around the world in the run-up to the 2020 presidential election to call attention to what he believes is an inhumane 1994 U.S. immigration policy that made trying to cross the unforgiving desert the best or only option for many would-be migrants. “This has been happening for 20 years — people are dying in the Arizona desert. Nobody, Republican or Democrat, seems to want to talk about this,” said De León, who believes the actual death count could be much higher because some people’s remains almost surely just weren’t found. The timing of the project is no accident for De León, who wrote a book called “The Land of Open Graves: Living and Dying on the Migrant Trail” based on his field work and research. Although President Donald Trump made immigration a centerpiece of his election campaign and has been banging the drum loudly for funds for a border wall, De León’s work doesn’t just focus on the current political climate: 1994 is referenced in the title because that’s when the U.S. implemented its border policy and when migrant deaths in the region started ramping up. Immigration experts say the 1994 initiative funneled would-be migrants into Arizona by strengthening enforcement at major border crossings. As more people tried to cross in more remote and dangerous areas, migrant deaths spiked, though border officials have blamed the deaths on smugglers and other factors. The Border Patrol says it is overwhelmed with the current volume of migrants, calling it a crisis. Officials say they apprehended about 66,000 people, including 36,000 parents and children, who were trying to cross the border illegally in February, which was an all-time monthly high. De León also sees a crisis, but one that wouldn’t be solved by the proposals coming from either party. De León said he began his career as a “traditional anthropologist,” researching ancient architectural sites in Mexico. That led him into immigration issues and, more specifically, “undocumented migration.” His move toward the forensic side emerged when his research team came across the remains of a 31-year-old Ecuadoran woman, Carmita Maricela Zhagui Pulla. He has since met her family, who stayed behind, and learned of their dire living situation. “That experience really got me much more interested in the fatalities that are associated with migration — ways to explore, study and document it, but also ways to translate that for a public audience,” he said. 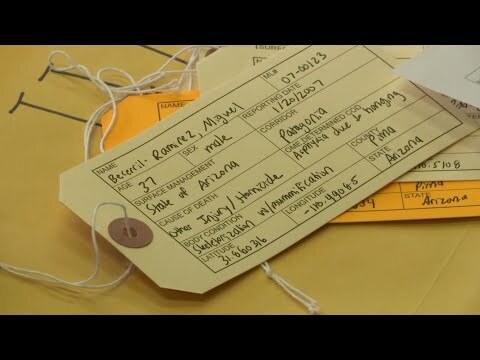 The roughly 600 Michigan students who volunteered to help were each asked to fill out at least five toe tags with information provided by De León and his team: the victim’s name, if known, as well as the date of recovery, location of death and condition of the body. De León could have printed out the information on the toe tags, but he said an important part of the project is to allow others to engage in the border deaths issue directly, and he implored the volunteers to view it as more than a clerical exercise. “So we’re asking that you come here for a half-hour to fill out five toe tags in a show of solidarity or witnessing or recognition of the fact that thousands of people have died while crossing the U.S.-Mexico border in the last 15-20 years,” De León told the students. Ximena Mancilla, a freshman studying psychology and criminal justice, thought of her own relatives as she worked on her tags. “My grandparents and uncles came here illegally, so knowing that, at some point they could have been the ones I could have been writing this about,” said Mancilla, who legally immigrated to the U.S. from Mexico in 2011. De León said that solving immigration problems shouldn’t be done through “deterrence,” which he blames for the border deaths. He said the U.S. should help “give people a reason to be able to stay home” by helping Latin American nations improve political and economic situations, and forge more consistent attitudes and policies domestically. De León, who collaborated on a previous exhibit that displayed belongings of migrants left behind in the desert, said making his work more accessible grows more important even as the environment in which he’s doing it becomes more challenging.